Aizawl, Feb 28 : Mizoram has achieved 10.50 per cent increase in foodgrain production during 2011-2012 which had been declared bumper rice harvest year by the state government. Mizoram produced 51948 metric tonnes of rice during the past year, a significant increase from 47,201 metric ton produced during 2010-2011. This was higher than the department's target of 52,000 MT. According to sources from agriculture department, as the number of farmers cultivating rice decreased the area of jhum cultivation also decreased by 5.53 per cent. The 51948 metric ton of rice was produced from 2162 hectares of land. The increase in rice production was attributed to the new farming technology- system of rice intensification. 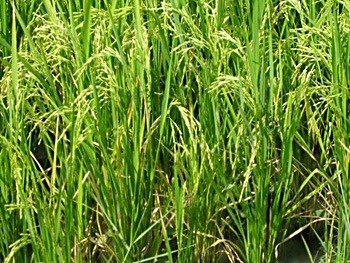 Rice produced from wetlands, however, witnessed 19.61 per cent increase. With the increase of 209 hectares of wetlands, rice produced from wet rice cultivation was 4061 metric ton. As many as 540 metric tonnes of rice was also produced from 360 hectare of jhum land transformed into wetlands during the past year. This was considered 100 per cent increase. In jhum cultivation, 146 metric ton of rice was produced, recording a 5.55 per cent increase, the source said. This was despite sharp decline in the jhum cultivation that decreased by 2736 hectare, a 9.57 per cent low. The agriculture department had introduced the improved farming system in different low-lying areas of Mizoram. It had been experienced that rice produce under SRI was double that of conventional farming system. At present, Mizoram produces only 25 per cent of the total rice consumption which is about 1,80,000 metric tonnes. The department targets to produce 52,000 MT of rice this year. It aimed at increasing rice produce per hectare of land in WRC from 1.6 MT to 2.5 MT and from 0.9 MT to 1.2 MT in jhum areas.